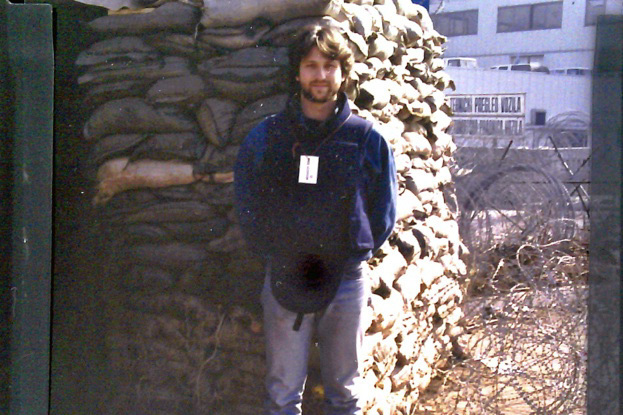 This essay was originally published in The Arizona Republic after a return from nearly a year of covering the siege of Sarajevo and the war elsewhere in the Balkans at the height of hostilities. Includes previously unpublished photos from Bensman’s private collection. 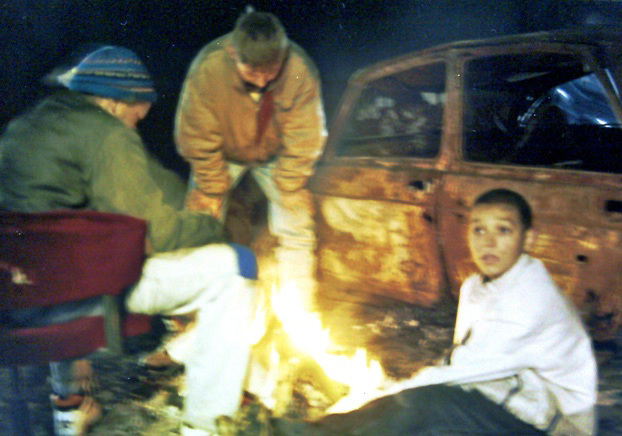 LATE ONE NIGHT NOT LONG AGO, some soldiers in the front line Croatian village of Pakrac invited me to come watch them lob mortar rounds at the Serbs for awhile. It had been a quiet night, aside from the usual distant bursts of machine gun fire. My hosts, all of them between the ages of 18 and 23, were out for a good time and would have had one with or without me. So I went. We were all a little bored and drunk. From a mortar tube on a height amid the rubble of destroyed housing, they sent – giggling – a half dozen shells to explode into the blackened, tortured valley below. 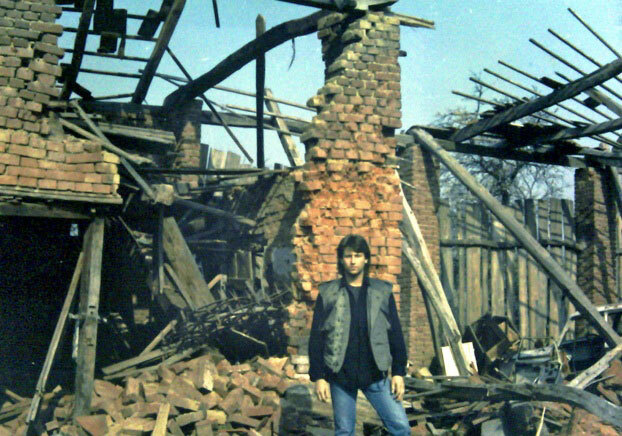 The Serbs sent us all hightailing – me in a sprinting panic – with generally aimed bursts of machine gun rounds that whistled and smacked walls all around us. Then, a bit later, they retaliated in earnest as we watched The Bill Cosby Show on a generator-powered television inside a bombed house serving as local command headquarters. Like the pounding footsteps of some relentless giant, shells exploded progressively closer toward our house. My uniformed hosts all reclined on couches, unwilling to react even when hells arrived immediately next door, and neither would I. When it became clear that the very next shell was going to land right on our house, nothing happened. There was just awful silence, except for Bill Cosby laugh tracks, stretching slowly over many long seconds. I sipped my whiskey with them at though I too had never lost an ounce of cool. 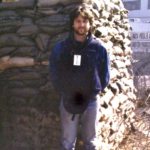 Back in Phoenix now, I spend a lot of waking hours reviewing such psychic out-takes from the many months I spent covering the war in Bosnia as a freelance reporter. I came home in August (1993). I guess what strikes me most now, in this strange glow of retrospect, is how the absurd and the obscenely dangerous eventually came to seem almost trivial. Only after returning to the domestic tranquility of Phoenix has my perspective begun to realign – a kind of downshifting of the soul. 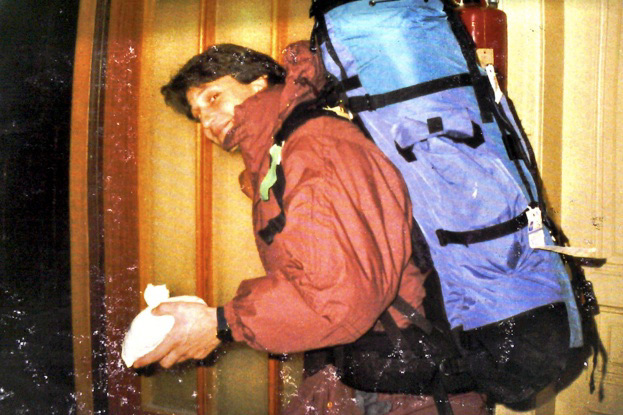 My cold journalist’s impartiality thaws now as seemingly forgotten snapshots and sensations from my time in the “Yugo-land,” as some in the press corps called it, intrude on me as fast food drive-throughs and crowded Phoenix shopping malls. Images stored in deep recesses of memory over the past year rush up periodically like bad medicine from a time-release capsule. Of nights gone psychedelic from streaking and exploding ordnance. Of full-grown men weeping hard like children. And of farewells. I see a morning when my only reaction to a mortar bombardment was sharp irritation that it had spoiled my breakfast. Or how I’d pull a pillow over my head to drown out the mundane sounds of battle so I could sleep, as casually as muffling out a dog’s bark. Checking the day’s battle conditions was as ho hum a thing as to a pilot reading the weather report before takeoff. “Boom Boom?” I’d ask the locals, pointing up the road. “Ahhh. Hvalah, dobra dan.” Thank you, good day. The whole thing is strange. I draw no hard and fast meaning from the phenomenon, other than that clearly the war is with me here in Phoenix as much as I am still with it in Bosnia. I wonder if the Lucic family is still alive in Sarajevo, or how Nermi is making out in the besieged village of Jablanica. Nermi sheltered and fed me for the five days I was trapped there in fighting, showing me his amateur photographs during nighttime bombardments and securing typewriters, paper and interviews by day. 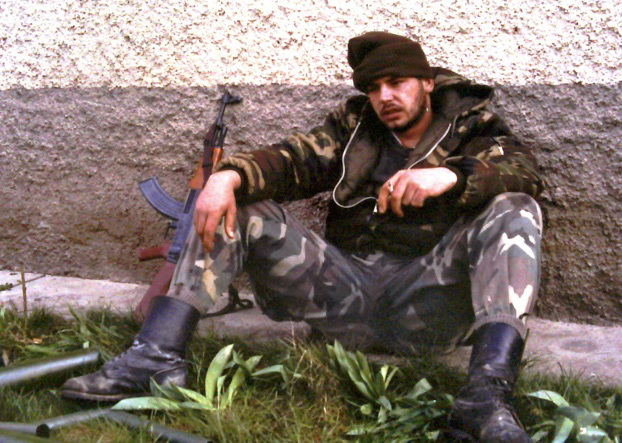 I suspect my friend Denis’ father never escaped from Mostar with the rest of the family, judging by military reports I see on late night CNN detailing the fighting, which restarted while I was in town. Denis is okay, though. He was a radio journalist whose family hosted me whenever I was in Mostar, where you couldn’t stay anywhere because all the hotels were bombed out. But now he’s just another broke refugee. I ran into him on a street in Prague in August, and after hugging each other over the pleasant surprise, we swapped stories over a few cold beers. He told me a tale of his escape from Mostar that would have seemed movie-worthy dramatic had I not heard similar ones a thousand times already. I wonder about all those peasant refugees I left behind after sharing floor space, bean soup and shelter from the explosions outside. I see now that some of the time I had regarded them merely as props in some play I was reviewing – disconnectedly – from the audience. But I stopped seeing them that way after awhile. Their faces are not so different from the ones I see in Paradise Valley Mall. 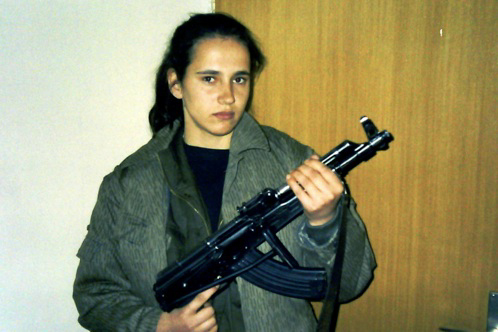 The articles I eagerly read now in the back pages of The Arizona Republic sometimes mention the names of towns in Bosnia where people are still getting killed months after I spent time in them. Turbe, Visoko, Tuzla, Ostrazic, Vitez, Knjic, Brchko, Gradacac, Kiseljak. I had close calls in these places and don’t think I can forget them. Once, I checked into a little inn that was still open just outside Kiseljak in Croatian-held turf, despite full-court battle. I’d arrived there after speeding in a rented car through battles that were laying waste to the area. The formerly allied Croats and Muslims had been fighting each other fo a week. No one knew who controlled what territory any more. Having nothing else to do with the evening, I went out to the parking lot and crawled under a broken and abandoned CNN armored press jeep. 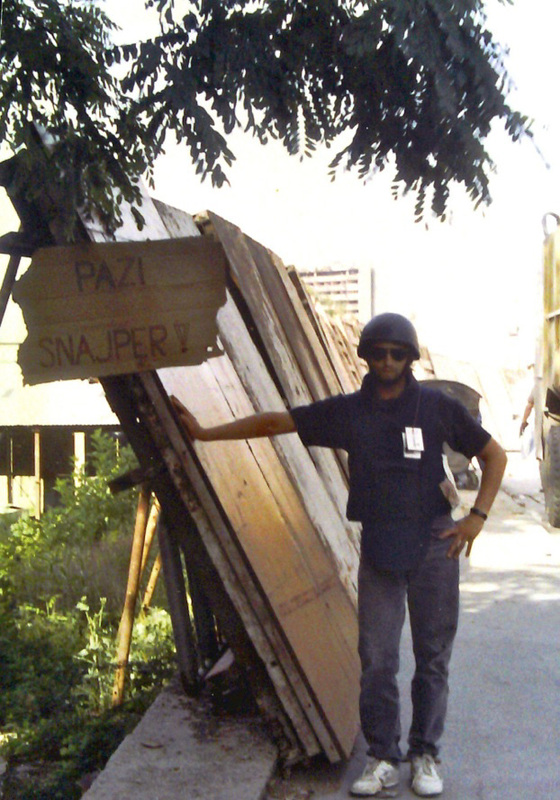 Resting my chin on a curb, I watched impassively as Croat militiamen torched one Muslim house after another down the street by pumping phosphorescent rifle rounds at them. Someone had set fire to a mountain above overlooking the valley to burn out Muslim positions too. Flames from that and the house fires in front of me filled the evening sky with a vast red-orange glow amplified by a white encompassing fog of smoke. The sounds of wood popping and crackling next intermingled with jarring gunshots, the smell of smoke and the sound of mortar explosions far and near. Red tracer rounds criss-crossed the skies back and forth, disappearing into the thick smoke clouds. Alone under the jeep, I watched this panorama of deadly pyrotechnics until it became boring. I sprinted back to my room to read a magazine by candlelight, except that the flame drew a sniper’s fire, bullets smacking the motel’s exterior. It only stopped when I snuffed out my candle and went to sleep. I never thought of any of this again until just now. While it was impossible to remain completely unmoved by the insanity playing out around me, there was always a new, more immediate problem to force it back to another day. How soon I was able to forget that time Muslim soldiers speeding by in a car casually leaned out a window with their AKs and riddled a passing pack of dogs with bullets. One died right in front of my car, writhing on the bloody snow with its intestines hanging out one of its sides. I was too busy moving with a column of Canadian tanks to pay it much mind. 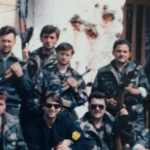 One morning, eating breakfast with colleagues around an outdoor patio table of a Bosnian inn deep inside an active war zone, a heavily armed soldier came sprinting toward us in a classic evasive zig-zag, looking over a shoulder. Clutching his weapon, he swirled onto the patio next to our table and took cover behind one of the brick columns supporting the awning over us. Our egg-filled spoons paused midway between plates and mouths, as we waited for whatever to happen. Breathing heavily from fear and exertion, the soldier girded himself, looked at us, gripped his assault rifle, took a peek at the direction from which he had just come, and re-launched his zig-zig sprint on past us. We just shrugged at one another and finished breakfast. It was the same with close calls. There was never time to dwell for long on a brush with death. But the remembrance of them today drives me to ponder the nature of fate, destiny and odds. A quick whirr of shrapnel and we’d move on without second guessing How Things Might Have Been. Like the time a sniper round passed six inches to the left of my ear. Or the day our speeding car was ambushed in Vitez by machine gunners on either side of the road. We found a bullet hole in the chassis of the car as British tanks whirred sand into dust all around us. We praised our luck and had lunch. There were several mornings when shell blasts woke me from deep slumbers, and I instinctively threw my body from the bed to the floor, then crawled back under the covers to finish the sleep. But then, what’s a close call anyway? 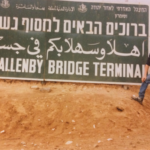 I haggled once with my interpreter over what constituted hazard pay as we prepared to enter a dangerous town. I actually found myself arguing that one or two mortar rounds does not a hazard make. He offered a few sniper shots. I low-balled the artillery and we settled on an hourly wage based on the potential rate of incoming. Reasonable then; absurd now. That’s not to say my adrenal glands didn’t get pumping from time to time. 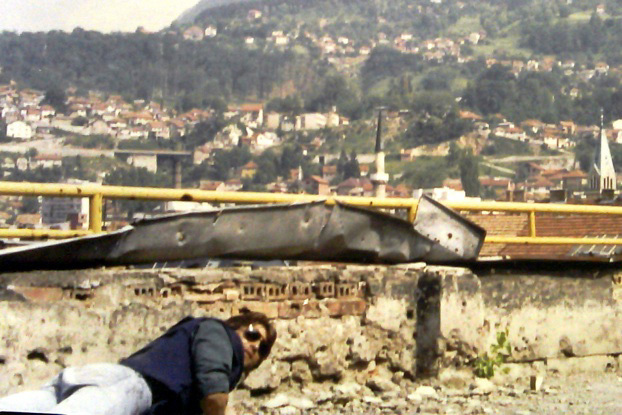 I’ve felt fear in Bosnia so paralyzing I couldn’t move. It was guttural, churning, stomach-twisting demon that inexplicably was forgotten soon after the danger had passed. I still can’t remember accurately what that degree of fright – or relief – feels like. But I remember once being completely unable to hold my camera steady enough even to push the shutter button. One winter day I was driving to a town to send some film when four scraggly Muslim soldiers, bandits, really, bolted out of the snowy tree-line and forced me to a stop at gunpoint, emphasizing their demand by locking and loading. With AK machine guns aimed at my head through either window, my knees and arms shook uncontrollably as I tried reasoning with my could be executioners. The front lines had shifted since the last time I’d driven through the area but no one had bothered to inform me. Somehow, for the price of only a few packs of Marlboros, I made it safely to the next checkpoint. A couple of hours later, I too busy writing and filing an unrelated story to a client to even think of the peril in what had just happened. Deadlines are deadlines. 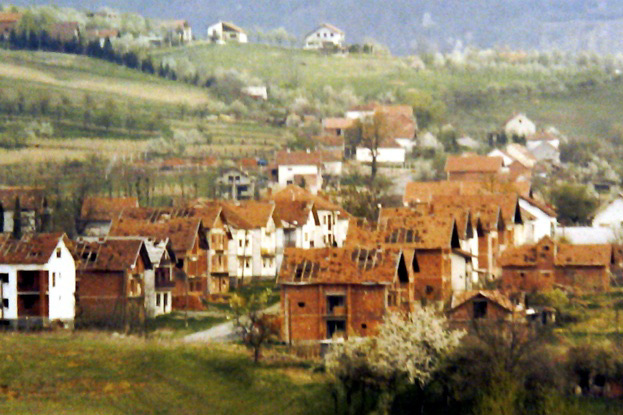 The one time my veneer of cold impartiality did break was in the tiny central Bosnia village of Tarcin, where 12,000 “ethnically cleansed” Muslim refugees living on bread and water had holed up. 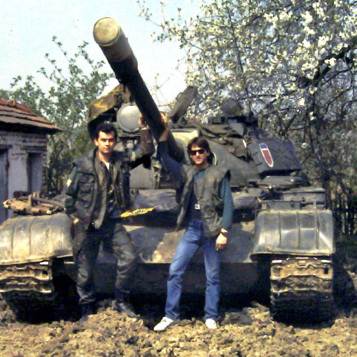 The Serbs routinely sent artillery rounds at them, for whatever reason. One of those barrages caught my two Italian colleagues and me off guard one quiet evening as we cruised through town in our rental car. We bailed out the doors on all fours and scurried around to the trunk on stomachs, pulling out bulletproof vests and gear while dozens of refugee pedestrians all around us went into sudden panicked flight. Still trying to tear into our body armor while laying down, we got up, dove, got up, dove, screamed conflicting directions at each other, huddled on top of one another in pitched terror as the ground heaved under new massive explosions. We finally made it into the thick-walled hallway of an aid cafeteria that reeked powerfully of urine and crowded in with dozens of wailing refugees. My arms were scraped and bleeding from diving at some point onto a twisted pile of scrap metal outside. As the shells continued to whine in and explode outside, I remember making a point of really noticing them. I looked into their sagging, watery eyes, one by one. In them I saw the essence of this one war: simple farming folk of no military consequence whatsoever, whose pastoral lives had been brutally exchanged for endless squalor and unspeakable obituaries. Now they were forced to suffer the indignity of scurrying like fearful beaten animals. Old crinkled men with nothing but the filthy rags they wore and patched shoes. Exhausted mothers and grandmothers wearied to death of endless worry. Skinny children on flour diets. I reached down to a weeping little boy right next to me and, tousling his hair, teared up with them in that filthy hallway. 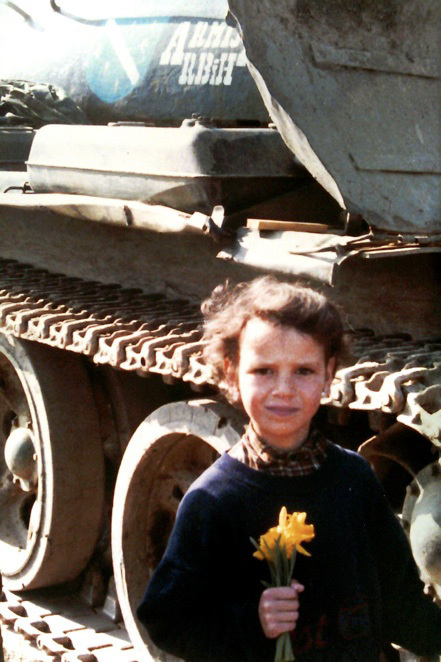 During one of my six trips to Sarajevo, I came upon a massacre on my way to an interview. Women were dead, their skin rent by shell shrapnel of some kind. I had seen casualties of the war but never so much blood. My revulsion and fear was so complete I had to look away. But it was too late. The scene was committed to memory in an instant. The wounded lay where they landed, bleeding among the water jugs they’d been carrying and randomly scattered articles of shredded clothing. Passersby tended them. 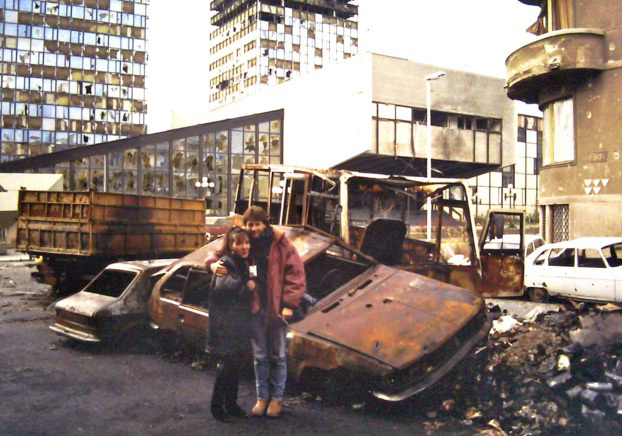 Everyone in Sarajevo at one time or another has had to clean up massacres on their way to find food or water. It’s an expected civic duty that no one shirks. Sarajevo. Lumps form in my throat sometimes when I think of the starving city and its victimized residents. 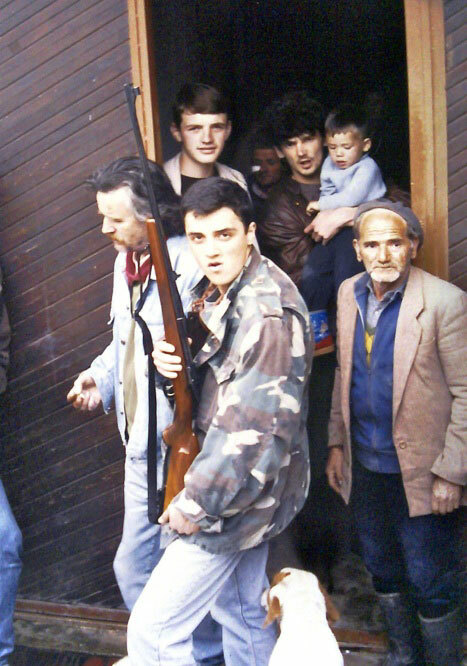 The Serbs had the city surrounded by constantly firing guns, rocket launchers and sadistic snipers, cutting off all food. 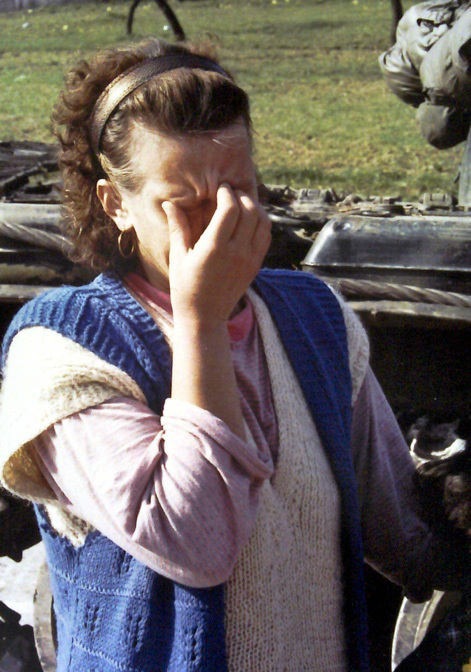 The Serbs were trying to starve and beat the civilian population into surrender. I’ve never seen anything more horrendous up close and personal. Yet helping hands always extended my way. When thinking of Sarajevo now, and even when I was in the city, I struggle with pangs of guilt for possessing a supreme privilege. Unlike those trapped and damned people, I could leave by C-130 cargo plane whenever my own filth, hunger and fear reached critical mass. I’d detect a powerful envy as they said their goodbyes. I met the Lucic family on my first trip – 21-year-old Alan, his 16-year-old sister Irena and their parents Jasna and Zlatko. Whatever their sufferings, they always took me in when I showed up unexpectedly at their doorstep on the second floor of 52 Marshall Tito Street. Each time I saw them, they were thinner, more pale and more despairing than the last time. Alan was fainting from malnutrition during my last visit and there wasn’t much I could do about it. They were contacts, sources, guides and friends to me. As a shoestring freelancer, I had little to give in return. I brought in as much food as the UN would let me carry on the C-130s. I gave them what little cash I could spare and ran messages for them to the precious Outside. But in hindsight I feel I didn’t help as much as I could have. I failed to get Alan a UN press pass he desperately wanted, which could enable him to get through Serb checkpoints to relative safety. I admit now it was partly because I just didn’t want the unnecessary risk of running the gauntlet of shelling while making possibly fruitless arrangements that had nothing to do with publishing stories. Alan certainly never displayed any similar reluctance while guiding me around town, exposing himself each time to shellfire and snipers. If he ever has a chance to read this: Alan, I am so sorry. I think of my final trip to Sarajevo in June and my final goodbye to Alan. I had a severe case of short-timer’s jitters. I’d lost my heart for the war by then. Most reporters pass through for a few days or weeks. But after so many months I’d become obsessed with surviving it. 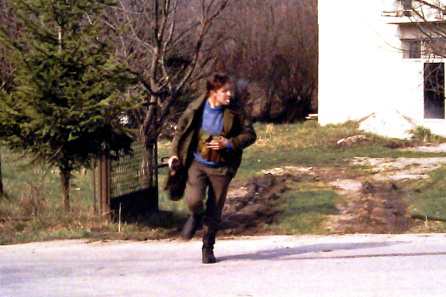 The snipers were shooting up the route as Alan and I made our way to the Holiday Inn, the jump-off point for UN armored personnel carrier rides to the airport, and then home for me to a safe apartment on the peaceful Adriatic coast town of Split. Alan had insisted on coming with me as far as the final strike zone of a 75-yard dash to the hotel, through the last open space. We sprinted from cover to cover, shots being fired all along the way. There was a lot more shooting as we huddled under the cover of an apartment hallway, looking at that empty, detritus-strewn 75 yards I would have to cross, knowing the snipers probably had it bracketed. When it came time for me to do the zig-zag sprint with my heavy backpack, I lost my nerve and fell back into the stairwell. 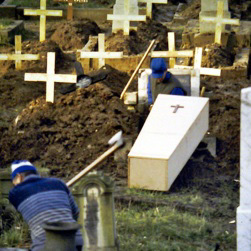 I concentrate on sorting out the incongruities of living here with the recent memory of Bosnia, like the smell of cordite, the sight of corpses, a pool of blood you had to step over in a street. 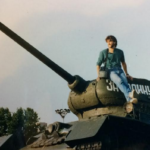 I recall sedately sipping a Coke from a sandbagged position at the Sarajevo airport while watching tank shells systematically demolish houses on the other side of the runway. Was anyone inside, I wondered, briefly? The sight of old familiar Squaw Peak seems to heighten a general sense of disconnection and alienation I’m told will ease up over time. I suspect it’s not a Vietnam-type post-traumatic stress thing so much as the slow fading of intensely vivid experience, or at least I hope so. 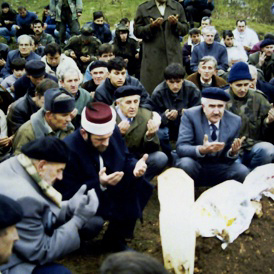 I care about Bosnia. I am sure of it. I look around my room at the souvenirs pieces of mortar shells, a live .50 caliber machine gun bullet someone gave me, the cast iron tip of a spent artillery round. A shoebox full of photographs. And I think that soon it will be time to box it all up and store it in the closet next to my still-muddy bulletproof vest and worn-out backpack.